The English-born American poet W. H. Auden was one of the greatest poets of the twentieth century. His works center on moral issues and show strong political, social, and psychological (involving the study of the mind) orientations. 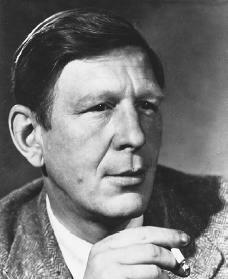 Wystan Hugh Auden was born on February 21, 1907, in York, England. He was the last of three sons born to George and Constance Auden. His father was the medical officer for the city of Birmingham, England, and a psychologist (a person who studies the mind). His mother was a devoted Anglican (a member of the Church of England). The combination of religious and scientific themes are buried throughout Auden's work. The industrial area where he grew up shows up often in his adult poetry. Like many young boys in his city, he was interested in machines, mining, and metals and wanted to be a mining engineer. With both grandfathers being Anglican ministers, Auden once commented that if he had not become a poet he might have ended up as an Anglican bishop. Another influential childhood experience was his time served as a choirboy. He states in his autobiographical sketch, A Certain World, "it was there that I acquired a sensitivity to language which I could not have acquired in any other way." He was educated at St. Edmund's preparatory school and at Oxford University. At Oxford fellow undergraduates Cecil Day Lewis, Louis MacNeice, and Stephen Spender, with Auden, formed the group called the Oxford Group or the "Auden Generation." At school Auden was interested in science, but at Oxford he studied English. He disliked the Romantic (nineteenth-century emotional style of writing) poets Percy Bysshe Shelley (1792–1822) and John Keats (1795–1821), whom he was inclined to refer to as "Kelly and Sheets." This break with the English post-Romantic tradition was important for his contemporaries. It is perhaps still more important that Auden was the first poet in English to use the imagery (language that creates a specific image) and sometimes the terminology (terms that are specific to a field) of clinical psychoanalysis (analysis and treatment of emotional disorders). In 1928, when Auden was twenty-one, a small volume of his poems was privately printed by a school friend. Poems was published a year later by Faber and Faber (of which T. S. Eliot [1888–1965] was a director). The Orators (1932) was a volume consisting of odes (poems focused on extreme feelings), parodies (take offs) of school speeches, and sermons that criticized England. It set the mood for a generation of public school boys who were in revolt against the empire of Great Britain and fox hunting. from Iceland (1937) and Journey To A War (1939). In 1939 Auden took up residence in the United States, supporting himself by teaching at various universities. In 1946 he became a U.S. citizen, by which time his literary career had become a series of well-recognized successes. He received the Pulitzer Prize and the Bollingen Award and enjoyed his standing as one of the most distinguished poets of his generation. From 1956 to 1961 he was professor of poetry at Oxford University. Auden's early poetry, influenced by his interest in the Anglo-Saxon language as well as in psychoanalysis, was sometimes riddle-like and clinical. It also contained private references that most readers did not understand. At the same time it had a mystery that would disappear in his later poetry. In the 1930s W. H. Auden became famous when literary journalists described him as the leader of the so-called "Oxford Group," a circle of young English poets influenced by literary Modernism, in particular by the artistic principles adopted by T. S. Eliot. Rejecting the traditional poetic forms favored by their Victorian predecessors, the Modernist poets favored concrete imagery and free verse. In his work Auden applied concepts and science to traditional verse forms and metrical (having a measured rhythm) patterns while including the industrial countryside of his youth. Coming to the United States was seen by some as the start of a new phase of his work. World War II (1939–45; a war in which France, Great Britain, the Soviet Union, and the United States fought against Germany, Italy, and Japan) had soured him to politics and warmed him to morality and spirituality. Among Auden's highly regarded skills was the ability to think in terms of both symbols and reality at the same time, so that intellectual ideas were transformed. He rooted ideas through creatures of his imagining for whom the reader could often feel affection while appreciating the stern and cold outline of the ideas themselves. He nearly always used language that was interesting in texture as well as brilliant verbally. He employed a great variety of intricate and extremely difficult technical forms. Throughout his career he often wrote pure lyrics of grave beauty, such as "Lay Your Sleeping Head, My Love" and "Look Stranger." His literary contributions include librettos (opera texts) and motion picture documentaries. He worked with Chester Kallmann on the librettos, the most important of which was T. S. Eliot's The Rakes Progress (1951). Auden was well educated and intelligent, a genius of form and technique. In his poetry he realized a lifelong search for a philosophical and religious position from which to analyze and comprehend the individual life in relation to society and to the human condition in general. He was able to express his dislike for a difficult government, his suspicion of science without human feeling, and his belief in a Christian God. In his final years Auden wrote the volumes City without Walls, and Many Other Poems (1969), Epistle to a Godson, and Other Poems (1972), and Thank You, Fog: Last Poems (1974), which was published posthumously (after his death). All three works are noted for their lexical (word and vocabulary relationship) range and humanitarian (compassionate) content. Auden's tendency to alter and discard poems has prompted publication of several anthologies (collected works) in the decades since his death on September 28, 1973, in Vienna, Austria. The multivolume Complete Works of W. H. Auden was published in 1989. Auden is now considered one of the greatest poets of the English language. Davenport-Hines, R. P. T. Auden. London: Heinemann, 1995. Hecht, Anthony. The Hidden Law: The Poetry of W. H. Auden. Cambridge, MA. : Harvard University Press, 1993. Smith, Stan. W. H. Auden. New York: Blackwell, 1997.
thank you for having this information available. it was very useful in my research. Thank you, you introduced me to some of his works. Thank you, this was a great help in my research paper on W.H Auden. He was an amazing man and an outstanding poet. I will continue in researching his breath taking art!! !